Mahalo nui - thank you in advance for your interest in my ceremony photography services. 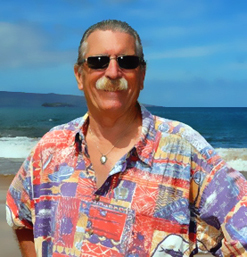 I've resided in Maui for the past 36+ years, and have provided professional, high quality wedding and ceremony photography for countless numbers of happy clients from around the world, beginning in 1999 (after some 15+ years as a multiple award winning photo hobbyist). I'm licensed by the State, and fully insured. I use (and highly recommend) Nikon (tm) cameras, lenses and accessories. My wife, Rev. Kolleen's All Ways Maui'd Weddings, Ceremonies & Photography offers four attractive ceremony packages that include my photography, but I'm also available for "outside" ceremonies, too! Photo Package A has me taking as many high resolution images as I can while we're together, for up to one full hour. Those images - often approaching 300 or more - will be mildly edited, and put into a privately linked online photo gallery. You, and whoever you share your album's link with can view and download all of the pictures via a compressed zip file. (Easy to do!) My price for this is $225 + tax = $234.37. Photo Package B has me taking some 300 to 400 pictures, for up to 1.5-hours. All of the more suitable images from among the total taken will be placed in a privately linked SmugMug online gallery. You can then choose up to 75 of your favorites from among them for a full custom edit in Photoshop. Your edited pictures, in turn, will be provided to you in an all new, stand alone album, at maximum resolution. I'll provide you with links to both albums which will allow anyone you share them with to see and download all of your pictures. My price for Package B, for parties of 10 or fewer persons - including the bride and groom - is $300 + tax = $312.50. For parties of eleven or more persons please add $52.08. If neither of the above two options addresses your specific needs, I'd be happy to entertain any ideas you may have. So, what do you have in mind? For further coverage (such as additional on-location photography, or for your reception, etc. ), my fee is $50 for each added half-hour increment or major fraction thereof. . Your photos will be copyright free, you'll own the rights to all images with people in them, but the photographer reserves the right to use any resulting purely scenic shots at his discretion. . When contacting me, please provide the following information, along with any relevant details: . 1. Your wedding or vow renewal ceremony's actual date and its planned starting time. 2. 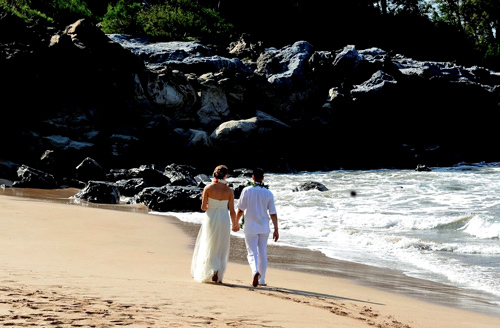 Your ceremony's location (the name of the beach, park, church, hotel or private location where your ceremony will take place). 3. The total number of persons expected, including the officiant, the bridal party and all guests (the guest count can be approximated). 4. Whether or not you'll need my services for your ceremony only, or for pre ceremony ("getting ready") photos and/or for your reception's coverage, too. 5. For non residents, your arrival and departure dates (to and from Maui) and the name of the hotel, condo or other lodging where you'll be staying. I usually respond to all email inquiries within 24 hours. For 'short notice' inquires (two weeks or less) please call me - preferably from 1 to 4 PM Hawai'i Standard Time. Mahalo nui loa - thank you very much - for your consideration of my services!